We've all heard of nachos, but totchos? It's like tater tots and nachos had a baby and, trust us, they're seriously out of this world. Make a big tray for Sunday football or taco Tuesday. They can be a complete meal or a super hearty appetizer. To assemble, all you have to do is cover crispy tots in a homemade chipotle queso, tons of shredded pepper jack cheese, taco meat, salsa, scallions, and jalapenos. No one will be able to keep their hands off this tray of goodness and you're definitely going to need to pass around some forks—it gets messy in the best way. The possibilities are truly endless with totchos because you can basically top them with anything savory. There are a ton of variations below, ranging from breakfast-style to Buffalo chicken. Try the traditional recipe and just mix up the meats—chorizo, shredded beef, chicken, and bacon are all great additions. Gather the ingredients for the tots. 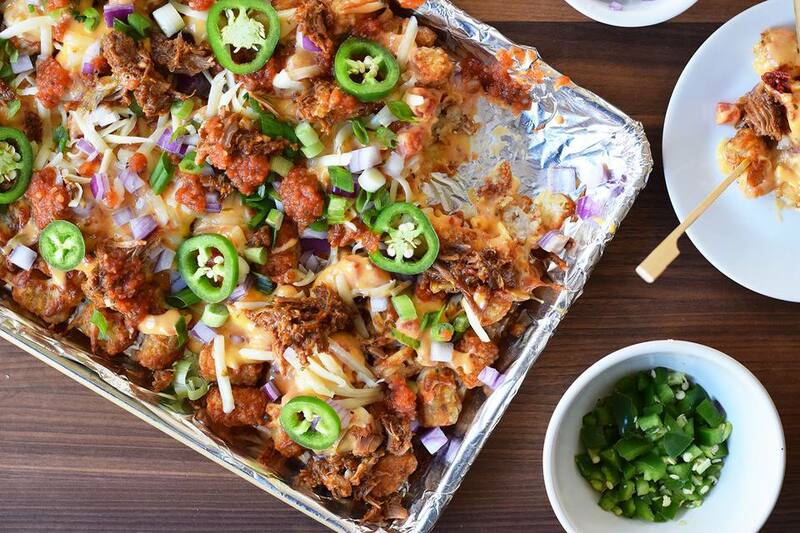 Spread the tater tots over an aluminum-lined baking sheet. Bake in a 425 F oven until golden brown, about 25 minutes.Turn halfway through baking to make sure they are crispy on all sides. Gather the ingredients for the chipotle queso. While the tots are baking, heat the queso in a small crockpot or in the microwave until smooth and completely melted. Stir the queso frequently until it has melted. Layer the pepper jack cheese over the crispy tots and place the pan back in the oven until the cheese has melted and is browned slightly. Heat up your taco or al pastor meat if needed. Spread the meat over the totchos and then top with some of the chipotle queso, onions, jalapenos, scallions, and more pepper jack if you want them extra cheesy. You must bake the tater tots before adding cheese. If you don't, the tots will not be crispy enough and they won't cook all the way through. Add as much cheese to the tots as you want. If you want to melt the cheese quickly, just place it under the broiler. Make sure to keep an eye on them so they don't burn! Sub in sweet potato tater tots for the classic potato tots. Chicken Bacon Ranch: Top with warm shredded chicken, ranch dressing, crumbled crispy bacon, and scallions. Cheesy Chili: Top with homemade chili, shredded cheddar, sliced scallions, and dollops of sour cream. Baked Potato: Top with shredded cheddar, dollops of sour cream, chopped chives, and crumbled crispy bacon. Bacon, Egg, and Cheese: Top with shredded cheddar, cooked scrambled eggs, crumbled crispy bacon, and hot sauce. Buffalo Chicken: Smother the tots with warm shredded rotisserie chicken, Buffalo wing sauce, ranch or blue cheese dressing, and chopped celery. No Basil? No worries! Pea and Walnut Pesto to the Rescue!